Ever since I was able to assemble over 100 issues of the Kecoughtan Kryer to create an online archive of the Lodge 463 newsletter I've wanted to do the same for Chanco Lodge. That goal has proven to be a difficult one to achieve because Chanco was a much smaller lodge than Kecoughtan, which means fewer newsletters were printed and distributed. Additionally, since I was in Kecoughtan Lodge the number of contacts I could approach for Kryers was much greater than those who were Chanco Arrowmen. 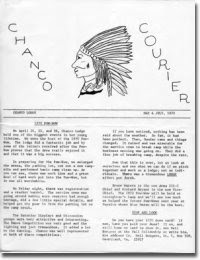 Larry Smith and DeWitt Holland each provided me with an issue of the Chanco Courier to include on this web site, and they are now scanned and available as PDF files on the Chanco Lodge page. Soon I will add a Chanco Courier page to organize the newsletters from that Lodge the same way I did the Kryers. Former Chanco Lodge Chief Ben Vincent has kindly promised to help me by providing copies of the many Couriers that he has in his possession. Lodge newsletters provide a unique and valuable glimpse into the Lodge's past, and I am excited at the prospect of adding them to the Chanco Lodge information on this web site to help preserve the history and tradition of that proud Lodge from Suffolk, Virginia. Chanco activity patch pictures completed!